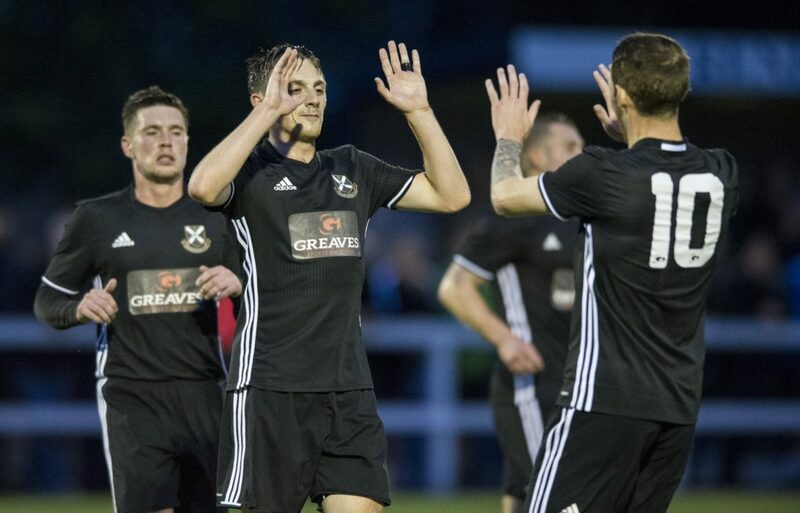 Nine-man Pollok advanced to a Sectional League Cup Final date with Clydebank after a 2-0 victory over Renfrew in the semi-final at New Western Park. ‘Lok took a 6th minute lead, Bryan Young’s corner was cleared out to Paul Byrne at 25 yards, his first time drive was tipped onto the post by Dale Burgess. Burgess then sprung up to deny Ryan McGregor’s follow-up, but was unable to keep out Adam Forde’s close range prod. Burgess kept out a near post shot from Stef McCluskey before Pollok doubled their advantage in the 32nd minute. Byrne’s ball down the left wing was met with an inch perfect pass by McCluskey to the underlapping Gary McCann who finished deftly. Renfrew’s best chance of the half came from a nice move down the left hand side, Jordan Longmuir blocking David Quinn’s first-timer. The final chance of the opening period came when McCluskey looped a header onto the top of Burgess’ goal frame. Pollok saw their ranks depleted by one in the 49th minute, McCluskey receiving the order of the march for a retaliatory kick on Thomas Miller. Despite the reduction in personnel it was ‘Lok who had the next attempt on goal, Young wriggling his way through to a one-on-one where Burgess came out on top. Gary McCann found himself in a similar position soon after with a similar result, before the unsuccessful triumvirate was completed when Burgess saved from Ross Brash. ‘Frew came close to pulling a goal back when Miller thundered a drive from 25 yards off the left hand upright. Scott Morton narrowly headed a Jamie Docherty corner past the post, before Pollok substitute Allan MacKenzie’s challenge on Quinn was deemed worthy of a straight red card by arbiter Stephen Brown.